Review posted July 18, 2018. 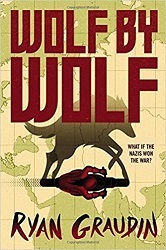 Wolf by Wolf is an alternate history novel about a world where Germany won World War II. On top of that, our heroine is a Jewish girl who was experimented on by Nazi scientists -- who gave her the ability to shapeshift her face. Now, my fundamental problem with the novel is I just couldn't bring myself to believe that any sequence of injections could make a person able to change their bone structure. Yael can adjust her height and add freckles to her arms -- but she can't get rid of her prison camp tattoo. Even if I could accept that, she can also change her already-grown hair to be a different color or be thicker. I don't quite see how that can work. However, the story is so gripping and so dramatic, I was able to forgive it for its unlikely premise. I'll grant you, it was sobering to read about Hitler's Europe as the 2016 election happened. The plot is a complicated one. Because Hitler has survived too many assassination attempts, he now never appears in public, except twice a year -- at the start and end of the great motorcycle race, the Axis Tour, where motorcyclists rode from Germania (Berlin) to Tokyo, the capital of the Japanese empire. Last year, a girl, Adele Wolfe, had disguised herself as her brother and won the race. Hitler had danced with her. Now Yael is going to take Adele's identity, win the race, and assassinate Hitler in front of the world when he dances with her at the victory celebration. This will be a signal for her allies in the Resistance to move and topple the Third Reich. But the race is long and grueling. Adele's brother has entered the race to try to stop her. -- He wants to save her life. Then there are the two other previous race victors who also want to be the first to win the Axis Tour a second time. Life and death are on the line. On top of that, Yael must navigate relationships blind. Once upon a different time, there was a girl who lived in a kingdom of death. Wolves howled up her arm. A whole pack of them -- made of tattoo ink and pain, memory and loss. It was the only thing about her that ever stayed the same.